Okay, maybe it's a stretch to say that this is a book review. I only made one recipe from it. But, I've discovered a new way to "preview" cookbooks: check them out from the library! It's perfect. I can pour over the recipes, decide on one or two to try and use those experiments as a measure of whether it's a cookbook I want to buy. Of course, so far, of the 5 cookbooks I've checked out from the library, I want them all. Anyway. I've been hearing and reading a bit about using a cold fermentation process for bread dough. It makes it possible to spread the bread making process over several days rather than setting aside an entire day for rising, etc. (because, who has an entire day anymore?!). There are several books out there that use this method and this is the first I've tried. The thing is, for me, spreading the process over several days means that I spend EVERY HOUR of each of those days obsessing about what I'm supposed to do next. Three days thinking about bread with only working on the dough for (at most) an hour each day...I don't know if that trade-off works for me. Maybe it gets easier once you're used to the method and you can just work it into your weekly routine. That criticism aside, this bread was unbelievably delicious. And incredibly easy. I used my own sourdough starter (thank you, John Graham for this piece of you that CAN'T move out of state). It's a little more loose than the starter in the book, which meant making small, but simple adjustments in the amount of flour I used. A Pain au Levain is a lot like San Francisco sourdough. I think the only difference is the addition of a small amount of whole wheat or other multigrain flour (I used rye). This gives it a little heartiness, a little color, a little texture. I love it. Not that I don't still have a giant place in my heart for San Francisco sourdough. But this was probably one (2) of the best (and most beautiful) loaves of bread I've ever made. Chewy outside, not too soft inside. Nutty, hearty, sour. We used it for panini sandwiches (filled with herbed turkey breast, thinly sliced apple, avocado, and gouda) and it was so so good. Sometimes homemade food IS actually better than what you can get at a restaurant/deli. Okay, sometimes it's always that way. TGIP Rating--Peter Reinhart's Artisan Breads Every Day--Judging on this recipe alone, I will most likely buy this book. There's one other book that uses cold fermentation that I want to try first. Next up: Oy. Apparently I'm gun-shy of the hand pies. I am. It's the same but different and I feel like I really need to gird up my loins to move forward with making them. I don't want to use any of the recipes I've seen because they're not mine. I want to use my pie dough recipe and my filling recipes, but I think the filling will need to be altered a little. Anyway, it is eluding me right now. I need a little time to work up my courage--maybe I'll do it in June. 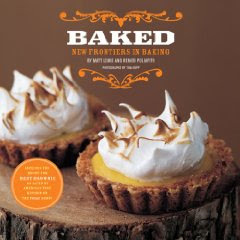 In the meantime, BAKED Sunday Mornings has the Orange Creamsicle Tart up next on their schedule. I'm all over that. Okay, so we had a little change of plans. Necessity is the mother of invention, right? We've been getting a lot of sweet potatoes this Spring through Bountiful Baskets. Prima and Seconda (and, frankly even mr. and I) have gamely tried vegetables that are not our usual fare, and found some new things that we like. A lot. Sweet potatoes have been kind of a sticking point. We've tried making french fries with them (somewhat successful), we've tried using them in curry, like we do regular potatoes (too sweet), and we've tried making hash browns with them (complete failure). Seconda is not interested in any of these formats for sweet potatoes. So, I told her next time we had sweet potatoes we'd try pie and see if we liked that. And now was the time. Mind you, I have an aversion to candied yams. I won't go anywhere near that nonsense on Thanksgiving. And I was afraid that sweet potato pie would be just like that. Well, I was wrong. Of course, I used a recipe from Alton Brown (who, if you haven't heard, is ending the glorious Good Eats that has been a source of unspeakable joy for us) (was that too much?). He just knows how to balance flavors right, in my opinion. And he may be the reason why we will be fans of Sweet Potato Pie henceforward. If I had tried any other recipe, I think I would have been disappointed. This was not as sweet as I imagined (was afraid) it would be. In fact, it was tangy (plain Greek yogurt). And light. mr. said it tasted like Springtime Pumpkin Pie. Which it did. Not as spicy, not as heavy, but equally delicious. I don't know that I could eat buckets-full of the filling on its own, but combined with the crust and the nuts (I didn't do the maple syrup drizzle--because I don't believe in maple) it was perfect. Crunchy and sweet and tangy and a little spicy (I added maybe a 1/4 teaspoon of ground ginger along with the other spices--and probably a full teaspoon of salt). Yum. Naturally, we had freshly whipped cream on top, but we thought it would also have been fun and delicious to top the pie with marshmallows and toast them a little with the kitchen torch. Playing on the idea of candied yams, but without all the overly sweetened-ness. Now, here's the only problem I had with this pie: the crust. My crust. WHAT? You may (or may not) remember my hunt for leaf lard. I wasn't able to find a local source, but I did find some available to purchase on the internet, and paid more to ship it (in refrigerated packaging) than I paid for the lard itself. And I would have been willing to continue doing that if the lard had turned out to be everything I'd heard it could be. If it had changed the flavor and texture of my pie crust in magically delicious ways. But it just hasn't. In fact, it has made the dough harder to work with (less elastic) and not as tasty. I think I like the slightly savory flavor that regular lard gives my crusts--the saltiness balances with the sweetness of whatever filling I'm using. So, yeah, disappointed by that a little bit. But, BONUS, I won't have to take out a second mortgage on my house to buy lard in the future. TGIP Rating--Sweet Potato Pie--KEEPER. Who knew?! Next up: I really will be making hand pies next. Cherry and apple. Just like the Golden Arches. Except delicious. And real. Do you have cookbooks that you keep around for one recipe? What's the matter with you?! I totally do! I'm certainly not saying that Baked Explorations is one of those cookbooks. For me. I am saying that even if this was the only recipe you liked in the book (which it wouldn't be), it would be worth keeping for THIS ONE RECIPE. Seriously, if you haven't bought this book yet...what are you waiting for!? Gooey. Chewy. Salty. Sweet. Chocolate-y. Caramel-y. Rich. Completely amazing. And not all that difficult to make. BUT. I'm not giving you the recipe for this one. Because you need to go buy the book. P.S. I recommend a nice glass of bourbon as an accompaniment (my favorite is Knob Creek). I'm serious. TGIP Rating--BAKED Sweet & Salty Brownies--Such a KEEPER. Wow. Next up: Hand Pies. Like turnovers. Or those nasty things from McDonald's. Only much better. I hope. I have no idea how to make these. We'll learn together. Next time you come over to my house for dinner, this is probably what I'll make for dessert. And we'll each have a piece. And then I'll send the rest home with you, because otherwise I'll eat the entire cake and gain 12 pounds. Just so you know. The cake is super easy. And if it weren't for a little situation named "high altitude", this recipe would have turned out perfect. I know better. I even blogged about it. But, I trusted Alton's temperature reading instructions more than my instincts. Next time I won't try to get the cake to 205 degrees internal temp, I'll just do the toothpick trick. It works every time. And, if I'm ever in a situation again where I need to make a cake a couple of days before serving it and need to refrigerate it, somebody remind me that a soaking with simple syrup or something similar can repair any amount of refrigerator (or freezer) drying out. Not that the cake was a crumby, dry mess or anything, it just wasn't as moist as I know it should be. Place whole coffee beans in a coffee grinder and process until you have a coarse grind. Heat 1-1/2 c. of heavy cream in a small saucepan on the stovetop until just simmering. Pour coffee grounds into heated cream and allow to sit for 15 minutes. Strain through a fine sieve or coffee filter. If you have French press this would be a good use for it. Add enough cream to make a total of 2 c.
Whisk together granulated sugar and cornstarch in a small saucepan. Whisk in coffee-infused cream and place saucepan over medium heat. Heat, stirring occasionally, until sugar dissolves, and mixture comes to a boil and starts to thicken. Pour sugar mixture into the bowl of a mixer, fitted with the paddle attachment. Mix at medium speed until mixture is cool. Cut butter into small pieces. With mixer at medium speed, gradually add a few pieces of butter at a time. Mix until it is thoroughly incorporated. Switch speed to medium high and beat until light and fluffy. Add vanilla and beat until incorporated. 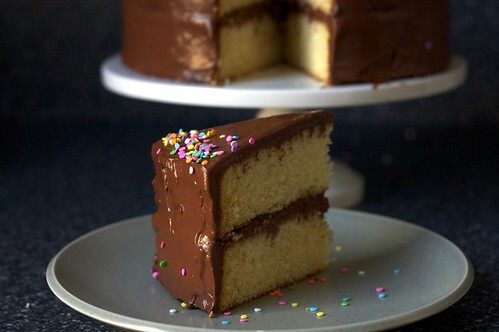 The cake and frosting go together so nicely. 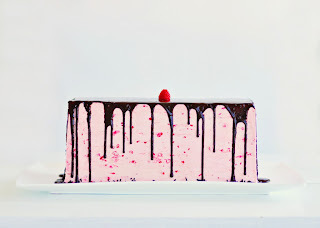 The cake is not too sweet, but also not too dark/bitter. It tastes chocolate-y and is light and lovely. The flavor of the frosting doesn't overwhelm the cake at all. The two flavors also don't really blend together, they just GO together. 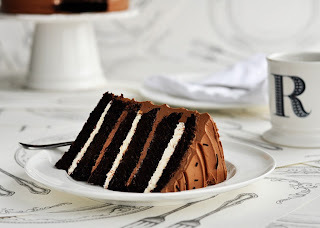 TGIP Rating--Alton Brown's Devil's Food Cake with my very own Coffee Buttercream--KEEPER. Easy enough to make that it doesn't even have to be a "Special Occasion" cake. Next up: BAKED Sweet and Salty Brownies. 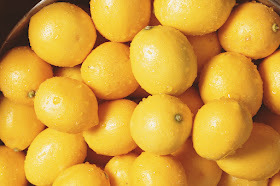 You know you want them.